One of only two churches dedicated to the 5th century St Hychan, this ancient single chamber church is mentioned in the Norwich Taxation of 1254. It was extensively restored in 1878 but has a window dating back to 1626, a reading desk from 1730 and a reredos from 1846. 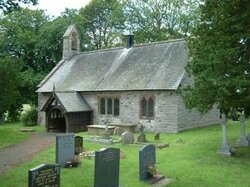 Hidden away deep in the countryside between Llanynys and Llangynhafal, this beautiful little church is a hidden treasure speaking of God's peace, constancy and changelessness in the midst of a busy world.